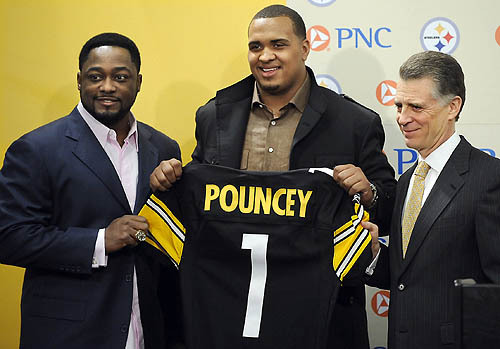 THE MEDIA ARE IDIOTS: Pouncey Obviously Referring to Blount | "IT'S A STEELERS WORLD"! ..is was most likely referring to one LeGarrette Blount, the former Steelers running back who abruptly walked out on the team during an explosive 266 yard exhibition put on by running back, LeVeon Bell against the Tennessee Titans on Monday night Football. Not former Steelers/Dolphins wide receiver, Mike Wallace. But as we all know this all became misconstrued because the media chose to do so. Taking an in general answer to an “in general” question and running with it in the wrong direction..as usual. ” Now I see why Marshawn Lynch gives the media short phrases”! And now so do I. Printing things out of context is no better than accusing someone of a crime they didn’t commit. So in my honest opinion..”THE MEDIA ARE THE BIGGEST TROLLS ON THE INTERNET”! sure are, they, the media, can make a person, ruin a person or save a person. And that is why I’m here, Anthony. To take jabs at the media. Thanks for your response.